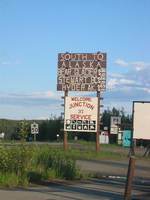 Location: "Gateway to the Yukon" milepost 635 just inside the Yukon border on the 60th parallel; Junctions of Alaska Highway 1 and Campbell Highway 4, near the junction of the Stewart-Cassiar Highway and the B.C. border. 300 miles east of Whitehorse. Population: Approximately 1,700. Visitor Information: Alaska Highway Interpretive Centre behind the Signpost Forest on the Alaska Highway, where the Campbell Highway branches off. For information regarding road and weather conditions call (867) 536-7469. Chamber of Commerce: Watson Lake Chamber, Box 591, Watson Lake, Yukon Territory Y0A 1C0. Phone: (867) 536-8022: Email: wlchamberofcommerce@northwestel.net; Website: http://www.watsonlakechamber.com. "Watson Lake Wye" began as a humble trading post in the late 1890s and was named after Frank Watson, who trapped and prospected in the area. Francis (Frank) Watson was born in 1883 in Tahoe City, Placer County, California and died in 1938 in Fort Saint John, B.C. In l897, at the age of 14, Frank and his father set out for the Yukon in search of gold. Fighting their way through unmapped country, they arrived on the upper Liard River in the spring of 1898. The Watson’s found themselves on the shores of a lake rumored to have been named "Fish Lake" by the native Kaska Indians for its abundance of fish. When his father returned to California in 1900, Frank stayed behind to work their claims, and later married a Native girl from Lower Post. The Upper Liard and its tributaries were his trapping and prospecting grounds while his home was on the shore of Watson Lake. The lake retained his name when construction began on the military airport in 1941 and the Alaska Highway, completed in 1942. Since the 1940s, the town has been a major transportation, accommodation and supply center. Present day Watson Lake is the key communications and distribution center for mining and logging activities in southern Yukon, northern B.C. and a portion of the Northwest Territories. 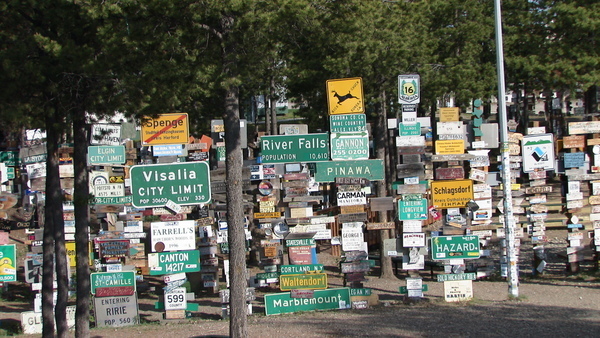 Watson Lake is well known for its famed collection of signposts started by a homesick soldier while the Alaska Highway was under construction. Over the years, the "Signpost Forest" has grown to over 72,000 signs as tourists from around the world have continued to erect signs from their hometowns. Watson Lake’s Alaska Highway Interpretive Centre is the first stop in the Yukon for northbound travelers. Besides providing visitors with full information about the Yukon, the Centre interprets the fascinating history of the Alaska Highway, beginning with its construction. A series of photo murals and displays and a three-projector audiovisual presentation dramatizes the entire history in a unique way with sound and visual effects. Stop in and say hello to Rene, Trudy and Lelah! Open 8AM to 8PM mid-May to mid-Spetember. 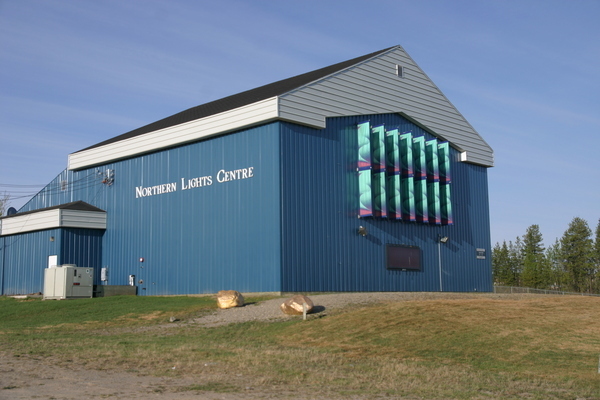 The Northern Lights Centre features exciting multi-media northern light shows inside a 100 seat Electric Sky theatre environment, and interactive exhibits explore the mystery of the Aurora Borealis. 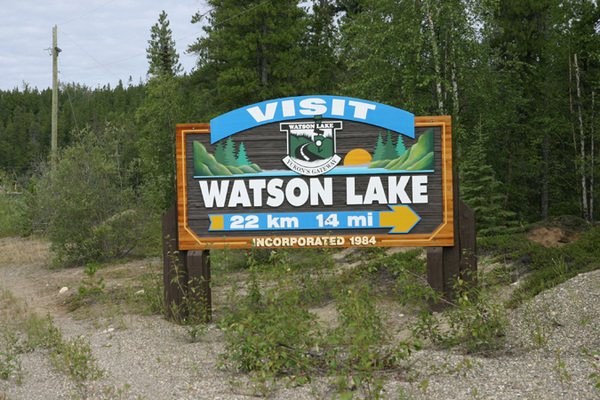 Visitors will find complete services available in Watson Lake. There are motel/hotels, campgrounds, R.V. parks, restaurants, bakery and library with northern videos. And if cold lakes do not appeal, the indoor heated pool located next to the Community Hall, is open all summer. In addition, water fun can be had by all at the Lucky Lake Waterslide Park. The Recreation Centre features a community hall, squash courts, fitness room, a youth centre, bowling alley, hockey arena and curling club. Trout, grayling and northern pike abound in the waters of southern Yukon. The public campground on Watson Lake has a boat launching area where visitors can easily put-in for fine trout fishing; and for the more ardent sports fishermen, there are several fly-in fishing lodges a short flight from the community. Several big game outfitters are also headquartered here. 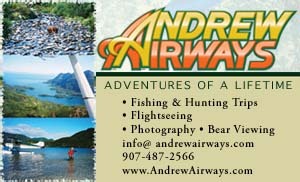 Local outfitters offer guided trips for hunting, fishing, photo safaris, horseback rides and hiking and camping. The upper reaches of the Liard River created a mini gold rush as early as the 1850s. Today, any sand bar along the river will produce fine gold for the amateur panner. To make sure the grounds are open, it is advised that a check be made with the mining recorder’s office. The Northern Lights Space and Science Centre is a unique facility featuring the amazing phenomena known as the Aurora Borealis. Boasting state-of-the-art panoramic video and surround-sound systems, the Centre incorporates interactive displays explaining the science and folklore of the Northern Lights as well as the Canadian space program, which played an important part in early Northern Lights research. The spectacular dancing Northern Lights are showcased in Yukon’s Northern Lights, a video that is broadcast in the NLC’s domed 100-seat theatre daily throughout the summer season. During the winter season, nature puts on frequent displays of colorful lights outdoors, when the Watson Lake community puts the Northern Lights Centre to good use for community events, space science education and movies.